Perfect for Elementary and Middle Schools who want to host a COLORFUL wallk-a-thon to raise the most money for your school. EARN UP TO 70% PROFIT! 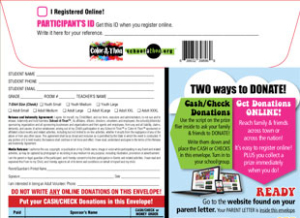 Not only does our donation-based color run program earn you maximum profits, it also includes a fantastic prize program and incentive program to boost student participation for your school/group. Bulk Color Dust: The more money you raise the more color dust we send. Individual Color Packs: One for each participant. 2 Hallway Posters: To promote your sale. 15 Event Posters: To promote your event throughout the community. Pledge/Collection Envelopes: One for each participant. Parent Letter: We print the letter for you. Custom Pledge Site: For each participant. Credit Card Processing: For online donations. Money Management Software: An easy tool to assist and organize the chairperson with counting & collecting donations. 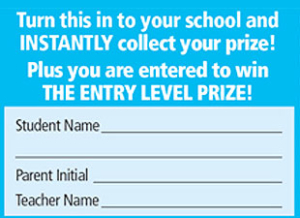 Student Awards Program: Great incentives including personal color packs, sunglasses, wigs and much more. Student Awards Pre-Packing: We pre-pack the awards per seller for easy distribution. Option to rent Color-A-Thon outdoor Flags for use during your event. Option to rent color-A-Thon Arch for your event. 30 route marker flags: Makes marking your course easy and helps guide your participants. R.E.A.C.H. for it: Curriculum program with daily audio announcements and video kick-off. Feed on Fitness Twitter Feed: Healthy lifestyle suggestions kids can use for life. DJ Party Guide: Suggested script, tips and suggested song list if you hire a DJ. Custom pledge site with banner ads for your group to sell and keep 100% of the profit. We suggest selling them for $500 each. Freight for all of the above items that are shipped to your group is included – No hidden fees! 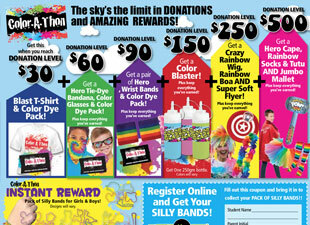 Contact us and ask your Schoolathon Sales Rep for more details! Check Out Our Family and Friends Color Club Program! It’s a great (optional) program that allows a student/participant to invite friends and family members to join in their Color-A-Thon Event for FREE! All they have to do is get donations. Each student receives their customizable site. Ability to upload custom picture of themselves. Students set their goals and monitor their progress. Email friends and family near and far. Instantly upload to Instagram, Facebook and other social media. Neighborhood donation base to world wide! Easy turn-in – sealable envelope keeps money safe. WE PROVIDE YOU WITH THE INSTANT PRIZES AT NO CHARGE! Prizes change from season to season to keep it new and exciting! Cumulative, innovative, and quality event based prize program. Packed by student and by class. Prizes come packed in our custom Color-A-Thon drawstring bag. Family and friends can donate and/or participate in the event!